We weren't dancing outside (this time), but there was a decent amount of walking outside to get from the parking lot to our destination, and it was raining. Rain = soggy dance coverups, which really isn't a good look, and it also means that Tiffany's hair goes into gigantic expansion mode. Also not a good look. But persevere we must. -2- "Why are there women wearing voluminous hot pink mumus on the stairway landing?! Never mind, we don't really need to go upstairs after all." Don't get me wrong, I'm appreciative. It's just that when college students are that enthusiastic about a dance performance, I suspect that they were three sheets to the wind before even arriving. I will say that they were *super polite* after we danced, coming over to us to tell us how great they thought the numbers were and how much they enjoyed it. And they didn't appear drunk or disorderly. So maybe they really did love us because we're just that good. ;-) But YEAH, they were into it. People were dancing in their seats and clapping in time to the music. Our kicky drum piece even ramped that enthusiasm up to the next decibel. So you could say it went very well. Us in motion. I love these ladies. -6- "I'm going to let the music keep running. Improvise, and try to get people up to dance with you!" Let's all groan together, shall we? Improvising is no problem for me, but I don't want to have to actually (a) talk to anybody, or (b) interact with them in any meaningful way. #introvert! But we are often tasked with doing this at these public events. And the thing is, people are either jumping out of their chair wanting to dance, which is easy, or glued to their seat in terror that you are going to ask them to dance. Me? I don't want to do anything above smiling at you winningly and dancing in your general vicinity. Unless someone comes over to me, I *really don't want to go over to you. * It's just my lot in life as a shy person. 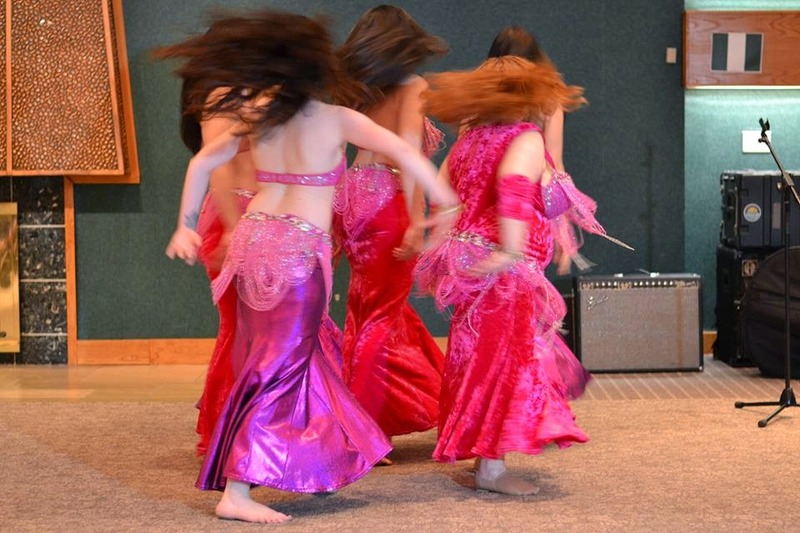 I have no problem making stuff up as I go along and dancing around a full perimeter of the room, that's what makes Middle Eastern dance so fun, in my opinion. But this interaction thing gives me hives every single time. And so for our second set, we danced our new Shaabi piece, and then the dreaded moment came: we struck our final post, and the music kept playing, so we all reluctantly improvised our way out to the crowd. The room had thinned a bit during the demo lesson, so our most enthusiastic supporters weren't there. This was a definite problem. As I improvised my way around the room, I could see some of my troupemates bravely trying to convince people to get up and dance, and getting petrified-looking rejections for their efforts. For my part, I just kept dancing and prayed for the music to end. It didn't. But I made it. Eventually, a few people got up and we made the most of that. Then we were done. Glory be. More dance fun to come in just over 2 weeks at our spring hafla! Then festival season sets in, and the real adventure begins. Stay tuned! 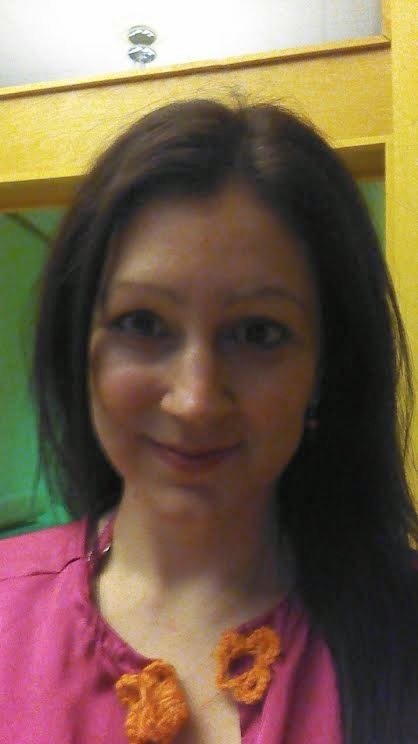 If you're still reading, thanks for hanging with me in this dance-themed 7 Quick Takes! 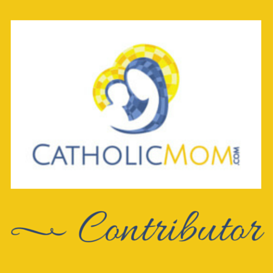 It's a passion of mine, and I hope that you enjoy reading about it as much as I enjoy writing about it. 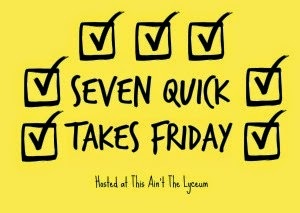 I'll talk to you all on Monday, but in the meantime, check out more 7 Quick Takes over at This Ain't the Lyceum!